Having outgrown our original workshop at Castle Ring we decided to design and build a new one that would be bigger, better and warmer. In other words it needed to be the mother of all workshops, the ultimate, never to be improved upon “uber” workshop. 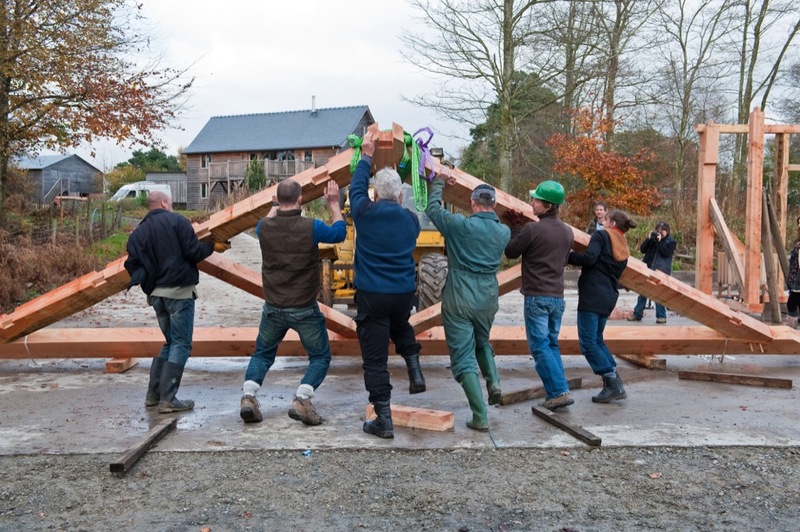 Timber framing is heavy work and most timber framers end up a lot shorter than when they started so one of the main requirements was to design it with the capacity to support a lifting gantry. To keep costs down and to support out local forestry economy we also decided to use douglas fir grown over the hill in the Teme valley. With a maximum safe working load of 500kg and a clear span of 9m, the frame needed to be carefully engineered to support itself and the additional loading of the gantry. King post trusses with metal straps and huge curved braces were deemed the best way forward. An articulated lorry load of logs were duly felled and delivered to Castle Ring where Paul Bufton and his mobile Serra Sawmill made short work of them providing both the structural timbers and all of the cladding. 4 weeks later the groundworks had been completed and the frame was ready to assemble. Craftily I decided to combine the raising with my birthday so that I could turn the whole thing into an event – I think everyone realised it was free labour dressed up as a party, but friends and family dutifully turned up anyway. A crowd of willing volunteers began with the sole plates at 11 am and by 5 pm the roof purlins were on (in the dark!) and we were back in the warm and dry where we enjoyed a birthday feast and the shared satisfaction of a brilliant day. Most people even said they would do it again. After the speed and elation of a successful raising it is sometimes hard to maintain the momentum required to bring a building to completion. The workshop was no exception and in fact it took nearly a year to get to grips with the studding, insulation, cladding, roofing, electrics and all the other important building bits that turn a frame into a functioning finished space. We recently installed solar PV panels which means we should be able to produce about 3300kw of electricity per year. The gantry works a treat, there is abundant natural light and dare I say it, working in such a space is a real pleasure.